Racing games in the modern era offer more realism than ever before. With photorealistic graphics and controls that mimic the real world physics, games have become more of a simulation than ever. What can you do to add to the experience though? 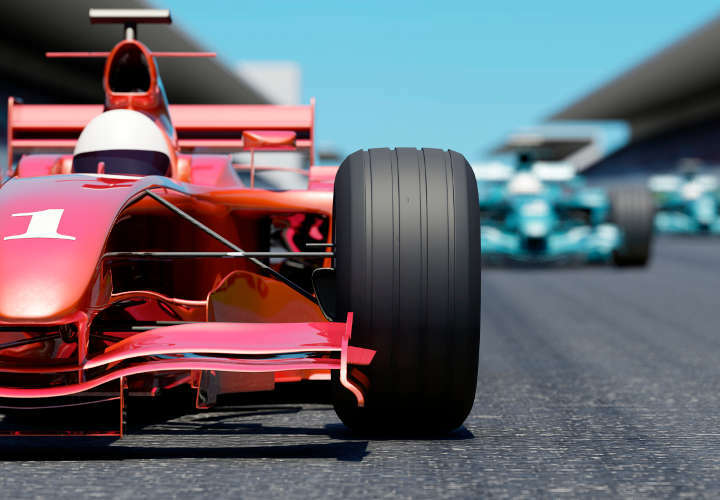 Investing in a racing wheel will make you feel closer to the action than ever. With racing wheels becoming more and more sophisticated as time goes on, it really is the next best thing to being in the car. So, which racing wheel is best then? 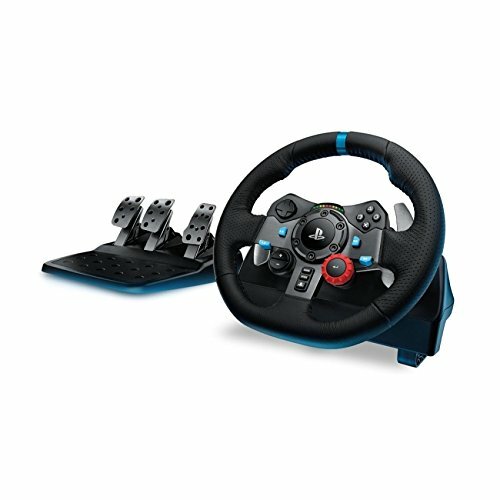 The Logitech G27 is a hyper realistic racing wheel that instantly puts you in the driving seat. It has a dual motor force feedback built in which simulates the feeling and experience of losing traction. It’s not just the force feedback where the simulation elements come in though. The stick on the G27 is a work of art, offering smooth transitions between gears. This combined with the 11 inch leather wheel means that it provides comfort and a genuine racing experience at the same time. As if that wasn’t enough, it also has paddle gear shifts too for when you feel like getting into serious race mode. Don’t worry about navigating the menus of your favorite games either because it has various buttons to ensure that you can trawl through the menus in no time at all. If you’re a racing aficionado then this wheel will put your right in pole position. 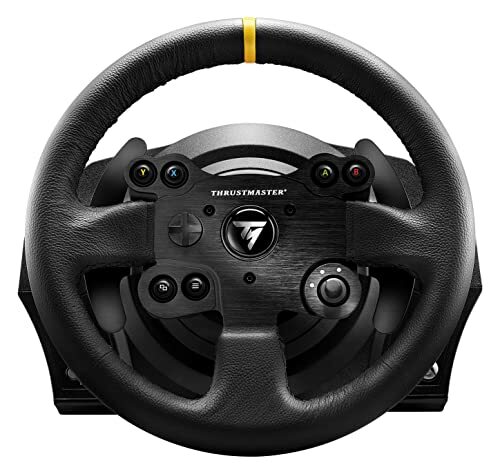 The TX Racing Wheel is a Thrustmaster product. Arriving with the wheel and pedals it instantly allows you to get right into the thick of the action. It has a reactive force feedback system that gives you the experience of actually driving while you play. It’s not just a great driving experience that the TX offers though. It also gives you the ability to chop and change the accessories that you use with it. So you can change the steering wheel fascia as well as adding a stick shift to it. 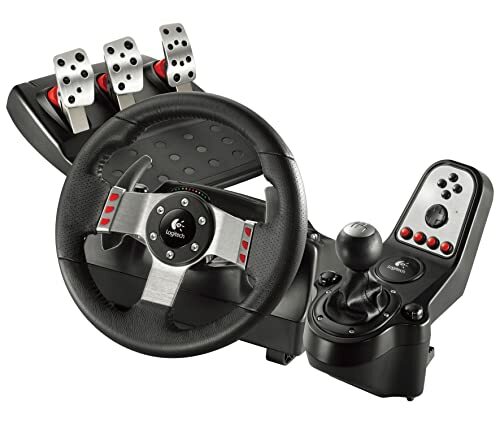 The customizable nature of the TX racing wheel isn’t the best feature it has though, that honor falls to the fantastic pedals provided with the TX racing wheel. The pedals have rubber mods inside to ensure that they offer more resistance the more you press on the pedals. This is called progressive resistance and ensures that there is a realistic feel to the whole racing experience. 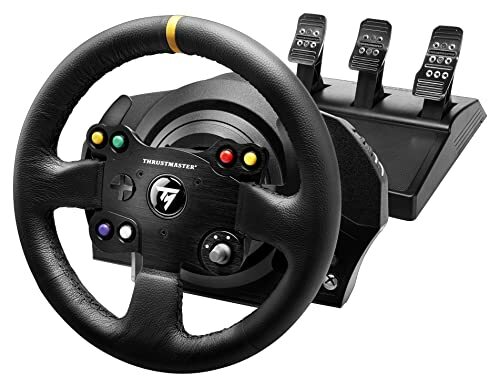 If you want a racing wheel that will provide an engaging experience as well as offering a good degree of customization then the TX is the one for you. The Logitech G29 says one thing the moment you open the box. Quality. The wheel is made with top quality components to ensure that it will last perfectly. The wheel itself is made from hand stitched leather. The mechanisms on the inside are powered by stainless steel bearings and even the paddle shifters are stainless steel. This adds up to a product that will last for a long time. The short answer is, yes. With a dual motor providing force feedback it accurately simulates the feedback the steering wheel gives as you drive. The pedals are stainless steel too and give a racing car feel to your gaming. The paddle shift is a great feature too with the LED combining to make it easy to know when to change gear. If paddle shifting isn’t for you then the G29 is also compatible with the driving force shifter attachment so you can change to a stick shift. The Thrustmaster TMX racing wheel offers a realistic racing experience. With a 900 degree circle it offers the same range of motion as a real car. This combined with the complicated belt and pulley system means that it is smooth movement as you turn the wheel. The flappy paddles make gear changes a breeze but if paddles aren’t your bag it is also compatible with a variety of Thrustmaster stick shifts. The pedals have just brake and accelerator options, but the buttons on the wheel allow for easy clutch use. To make using the wheel easier there is a simple to use clamp on the bottom so you can lock it in place when you’re playing. This makes it a lot easier to steer around those hard to navigate tracks, especially as you won’t have to worry about the wheel moving with you. The force feedback offers realistic racing sensations and makes sure the wheel fights you round every corner, just like a real car. 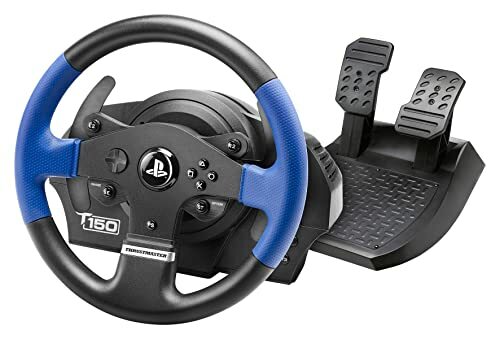 The Thrustmaster T300 RS GT is licensed for use with Gran Turismo. As it is optimized to be used with a hyper realistic racing sim, you would expect it to be as realistic as possible. Does it live up to those expectations? 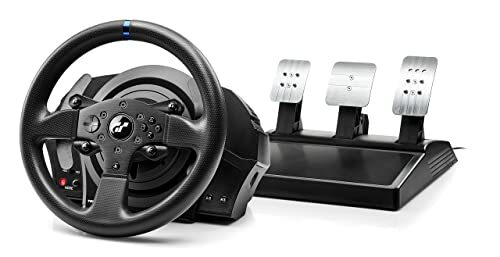 Offering the Thrustmaster patented H.E.A.R.T system for incredible accuracy, the steering wheel has in excess of 65,000 positions it can be moved into. This allows for supreme levels of realism when indulging in your favorite racings games. The T300 RS GT also has a brushless motor powering its force feedback technology. This means that not only does it provide realistic force feedback but it also does it without making too much noise. The steel pedals on the RS GT mean it has a realistic feel and the paddle gear changes offer a real racing experience. They can be changed out for a stick shift though with Thrustmaster compatible accessories. The Thrustmaster T150 has a number of great features to set it apart from other products. With excellent force feedback that is completely adjustable, 1080 degree steering wheel and compatibility with other Thrustmaster products. The force feedback allows you to adjust the levels to suit your playing. You really can simulate any driving situation with the immersion touch sense technology. The pedals are fully adjustable too allowing you to set them exactly to your own specifications. 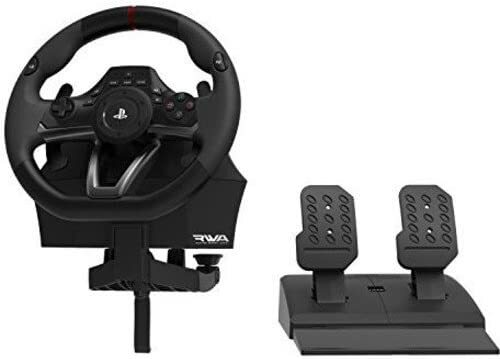 The paddles behind the steering wheel allow for swift and easy gear changes, but if paddles aren’t your thing a variety of Thrustmaster accessories can be used. The ability to use stick shifts, different pedal sets and even a handbrake all add extra layers to the T150. Overall the T150 offers excellent features and gives a realistic experience when playing. The ability to add extra peripherals means that it can give a complete experience. You’ll almost think you’re in the driver’s seat when you set up your preferred settings. The HORI racing wheel has an official Sony endorsement to help it along. It nails its flags to the mast from the off with the PlayStation buttons on the front of the wheel. Does it live up to the lofty expectations that come with this endorsement? Let’s find out. The first feature that helps the HORI to stand out from the crowd is the alignment mark at the top of the wheel. When you’re engrossed in your race, it helps you to see the position of your wheel. This means that you can ensure that you know where and how far to turn your wheel. The force feedback ensures you get the requisite amount of resistance as you steer and the pedals offer adjustable pressure levels. You can even change the sensitivity of the steering wheel if it doesn’t give you what you want. The pedals help with the comfort of racing with a retractable footrest, which makes it a lot easier on your feet when you play. The rubber grip on the wheel makes it easier to hold while you’re turning and in general it offers excellent control as you drive. The ThrustMaster VG TX racing wheel is a high quality product that ensures it has the finest quality components. This ensures that the build quality of the VG TX is right at the top of the totem pole. Does it all come together to create a top class racing wheel though? The steering wheel is a wonderful hand stitched piece that feels absolutely amazing in your hand. The force feedback ensures that you get a realistic racing experience giving you the right amount of resistance in those turns. The VG TX can be easily attached to any racing cockpit and the central attachment system means that you can attach it to any desk or table. That makes creating the perfect racing seat as easy as can be. The paddle shifts are fast and accurate and the pedals offer realistic resistance. The brake pedal even has a rubber mod so that it offers progressive resistance. They are all fully adjustable too so you can get them exactly how you want them. The moment you open the box to this racing wheel you instantly get a sense of excitement. There is something about the iconic Ferrari logo that brings out the best in people. Does the Thrustmaster Ferrari 458 Spider racing wheel live up to its lofty expectations? The answer to that is coming right up. The first thing you notice about the Ferrari 458 racing wheel is the paddle for changing gear. 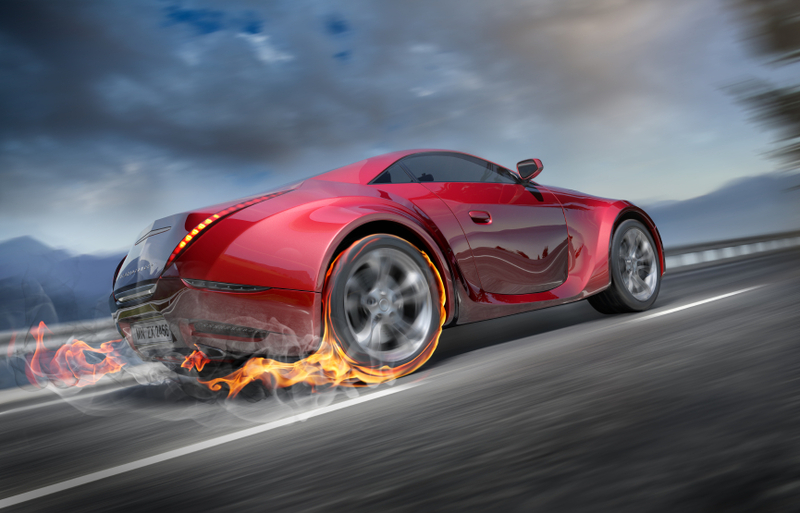 They are obvious instantly and allow you to easily shift gears without any hassle. The wheel itself has an excellent red rubber grip to allow for those tense cornering moments. All of this is punctuated by the quality force feedback that the Ferrari 458 racing wheel provides. Every corner fights back at you, just as though you were sitting in the driving seat during an actual race. The pedals can have their angle of incline adjusted to match your own personal preference. The brake pedal also has a progressive resistance just like in a real car. 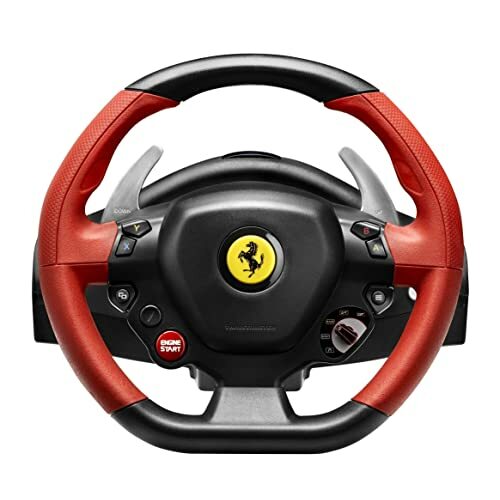 Using the Ferrari 458 racing wheel just adds an extra dimension to your racing game experience. 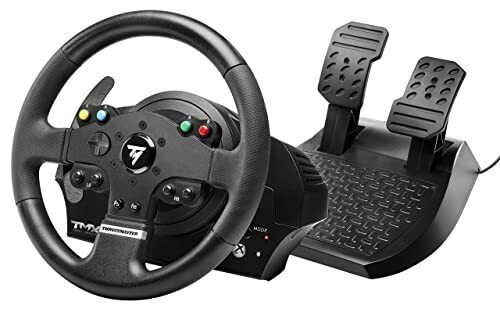 When it comes to buying a racing wheel for your gaming system there are a number of factors that you need to take into account. The first factor is undoubtedly the price. Why you ask? Well, it’s obvious that when it comes to price, the more you pay the better quality you get generally speaking. If your budget reaches to the moon then you should be aiming for the higher end models. If you are on a lower budget, then the lower priced models should be where you aim. Your console of choice is also an important factor. Some wheels work better with different consoles. Wheels made specifically for that platform will obviously perform better on it. It’s like having the wrong controller for your console, it just won’t work well. So if you see a wheel that is designed specifically for your console, it stands a chance it will work well. The number of features is the next factor that you need to look into. If you have a selection of features that mean very little to you, then maybe that wheel isn’t the one for you. If you see some features that make you do a jump for joy, then you should be aiming for that wheel. Don’t accept what you don’t want just because it is near the top end of the market. If what you want is cheaper, then go for that wheel. Finally, you should always check out reviews from people who have owned the wheel. Find out what the issues it might have are, and see if they can be solved easily. See which wheel will be most reliable and will offer you the best experience. The main thing is to not be scared off by bad reviews. No product will have a perfect review from everyone. Some people are born to complain after all. 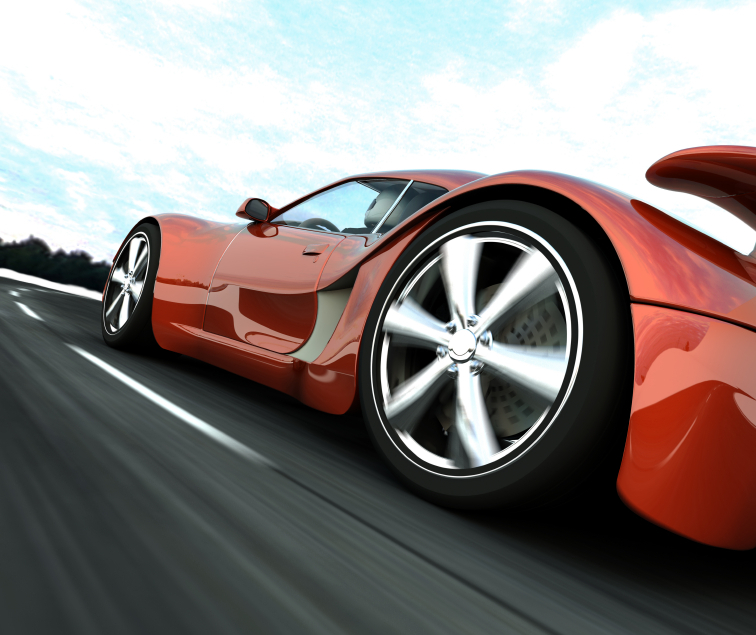 Ensuring that you have a high quality racing wheel is imperative. Take on board the tips when it comes to buying yours and make sure you aim at the level you want to play at. If you’re a casual player, maybe a wheel isn’t for you. If racing games are your life then a wheel would be a great investment. These wheels offer an extra level of immersion in a time when games offer unrivalled levels of immersion and accuracy. Make sure that you live up to those levels when choosing your wheel.